There is a need for a clear conceptual framework before one attempts to understand the relationship between Islamists and the human rights movement. The human rights movements in many Western countries combine a social arm with a legal/organizational arm and sometimes have partisan/political backing. As such, a movement is a comprehensive entity that uses its tools and utilizes its representatives to advocate for certain objectives and realize specific gains. The Arab human rights struggle, however, is split along the ideological landscape. Everyone practice it, including Islamists, but its definition exclusively covers non-Islamist rights organizations, since their establishment by, mainly, leftist and Nasserist figures.1[In Arabic] Yasmin Shash, “The rise, development and challenges of the rights movement in Egypt. Research papers”, Arab Reform Initiative, 4 August 2017. Available at www.arab-reform.net/ar/node/1095, pp. 3-4. These organizations can hardly be considered a ‘movement’, not only in quantitative terms, but also in terms of the diversity of issues they tackle without a clear overarching intellectual framework. These organizations have clashing positions on issues such as funding, belong to various kinds of local and external networks, and take different positions vis-à-vis the political regime. Their operational strategies include, inter alia, documentation, solidarity campaigns, legal aid, and campaigning. Observers are somewhat confused when analyzing the Egyptian civil society scene due to the politics of “substitution” or “replacement” used by some parties. By this I mean, for example, that a researcher following the behavior of professional associations could identify how they resort to political performances that are not very different from those of political parties. Analytical frameworks of political parties might in this case prove to be more explanatory for the phenomenon at hand, than analyzing it from the standpoint of being representative professional entities, and so on. Some studies assumed that rights groups “contributed, even if in small ways and from the tight corner to which they were constrained, to the uprising of 2011.”2Khaled Mansour,” Egypt’s Human Rights Movement: Repression, Resistance, and Co-optation” in: Report: Arab Politics Beyond the Uprisings, The Century Foundation,18 April 2017. Available at tcf.org/content/report/egypts-human-rights-movement/ After the revolution, some believed that their main role was to monitor the performance of Islamists, and to hold them in check, after their political ascendance. In parallel, their position towards the State was unstable, to the extent of supporting the rebellion against an elected president and welcoming a military intervention in the democratic process, in spite of the historically well-known crackdown of military regimes on human rights. These organizations failed, before the 2011 uprising and at the moment of a huge momentum in 2011 and 2012, to deepen and broaden its support base. They did not heed the hostile signals the State sent to human rights NGOs, regularly and repeatedly, before the uprising and right after it. Nor did they notice the clear trajectory towards neutralizing all independent NGOs at large. This is exactly what happened when the Parliament passed the NGOs bill in 2016, and after it was promulgated as Law 70/2017, along with the amendments to the National Human Rights Council law of 2003 that were passed in early July 2017 as well. This paper cannot account for the whole matrix of complex relationships between Islamists, across the spectrum, and human rights organizations, in each and every sector. The paper, however, seeks to review, in broad brushstrokes, the contours and important turning points of the relationship between the two groups of actors.3This paper is partially based on the author’s direct observations and her presence in some of the events over the last few years, as an active citizen in civil society, although she does not belong, organizationally, to any specific institution, party, or group. It is hardly possible to understand the interactions between rights groups and Islamist movements without exploring the moment these groups were established. Most of the leaders who founded the Arab Organization for Human Rights, that soon gave birth to the Egyptian Organization for Human Rights, followed by the dispersal of founders among various platforms, had Marxist and Nasserist backgrounds, at the moment of breakdown of these ideologies. They turned towards human rights as a “Universal” vision, and a less biased alternative ideological framework, on the one hand, and a more “objective’, ‘technocratic’ and ‘professional’ platform on the other hand. It was also the moment the Muslim Brotherhood made their entry into the newly born representative democracy of the early 1980s. The emerging human rights actors were viewed in opposition to the prevailing religious perceptions, in terms of jurisprudence, mobilization, and institutions (including official religious institutions). A clear position came through: that religious conceptions and the legacy of Islamic traditions are laden with threats to human rights; they are not suitable except for those who believe in them, and; they come with the possibility of extremism and violating the rights of others.4Moataz El Fegiery, Islamic Law and Human Rights: The Muslim Brotherhood in Egypt, New Castle upon Tyne: The Cambridge Scholars Publishing, 2016. Early conflicts within that emerging rights faction were concerned with the inclusion of Islamists in the Egyptian Organization for Human Rights. The majority refused, and adhered to a vision of “civil/secular” cohesion of the organization. Meanwhile, various factions in the organization disagreed on foreign funding. This was a moment that will leave its mark on the relationship between the two camps up to the present. The first generation of rights activists dispersed into various organizations after major disputes in 1993. Most dedicated their efforts to activism and advocacy, while the CIHRS paid special attention to theoretical and intellectual engagement with human rights issues, producing many works in this regard. There is, for example Moataz El Fegiery’s studies about the Muslim Brotherhood and human rights. In his work, he argues for a link between the MB and Shari’a, where Shari’a and Islamic jurisprudence are presented as a threat to human rights, if they are ever codified into law. The CIHRS has had a special focus on Sudan, publishing n celebrating the work of Sudanese academic Abdullah Al-Nai’m, who is a follower of Mahmoud Mohamed Taha. The latter was executed for apostasy in 1983, by the Ja’far Al-Numeri regime, after Shari’a was declared the law of the land in Sudan. In line with Taha’s work, A-Nai’m stresses the need to break free from Islamic jurisprudence or fiqh, and to establish a framework that is essentially normative or ethical, rather than a legislative/legalistic one, in making use of the Islamic framework. In general, there seems to be a confusion between contemporary movements, such as the MB, and the rich legacy of centuries of ethical and legislative theories, judicial precedents, and institutional models, that extended from the Atlantic shores to China. This is also the case in spite of critique that many waged, including the author, against the MB, specifically since the mid-2000s. This critique highlighted the fact that the MB/s knowledge of fiqh is, strangely and amusingly, little, while their awareness of relevant contemporary ijtihad outside Egypt, and even inside it, is really poor. The MB’s vision regarding a disciplined and rigorous renewal of Shari’a is almost absent altogether, in spite of decades of rhetoric about the need to applying Shari’a.5The parliament exerted deeper and more extended efforts on this front, in comparison to those of the MB in Egypt. This includes, for example, efforts between 1978 and 1983, which were simply ignored and dismissed as part of former president Sadat machinations to contain and coopt Islamists. See also in Arabic:هبة رؤوف عزت، نحو عمران جديد، الشبكة العربية للأبحاث والنشر، 2015، ص 109-170؛ وجاسر عودة، الدولة المدنية: نحو تجاوز الاستبداد وتحقيق مقاصد الشريعة، الشبكة العربية للأبحاث والنشر، 2015، ص 7-23. The absence of a clear MB vision based on substantial efforts to renew Shari’a was clearly manifested in their confused performance, in this regard, after 2011. They did not possess a clear blueprint for a genuine Islamic mode of governance, how to bridle security agencies, how to enhance public Shura, rebuild platforms of ijtihad, liberate the economy from capitalist investment strategies. Instead of recruiting religious institutions, such as Al-Azhar and Darl Al-Oloum for example, to play intellectual, legislative and educational roles, the MB gambled instead on mobilizing young people in these institutions. There was a prevalent intellectual confusion due to the ambiguity of how truly “Islamist” the MB movement was on the one hand and the possibilities of a renewal of fiqh on the other hand. Thus, human rights NGOs kept on looking in for humanist philosophies in the common traditions, while dismissing fiqh as a non-renewable framework. Rights groups that took over this intellectual task, beside the operational rights advocacy struggles, did not produce a substantial body of work that teases out a distinct stream of “Arab” critique for the modernist human rights approach, matching the ones produced by critical Western voices, within their cultural sphere. This was caused by two factors: First, rights activists are not adequately familiar with the Islamic scholarly tradition and fiqh, given their Leftist and Nasserist backgrounds. They kept on looking for suitable philosophical frameworks for human rights in the common cultural heritage to enable a “secular” relationship to the past.6Intellectual voices within the rights groups studied the humanist stream within the Islamic tradition in the same way Leftists were interested in the material philosophy in Muslim history. See in Arabic:حسين مروة، النزعات المادية في الفلسفة العربية الإسلامية، دار الفارابي، 2002 (4 أجزاء)؛ عاطف أحمد (محرر)، دراسات في النزعة الإنسانية في الفكر الوسيط، ط2، مركز القاهرة لحقوق الإنسان، 2014. Second, rights groups, since they were founded, are ontologically grounded in Modernism as an intellectual framework, after the Socialist regime’s crisis. This consequently made them wedded to a legalistic approach, which necessitates accepting state sovereignty as part of the imaginary of methodological nationalism.7Heba Raouf Ezzat, Beyond Methodological Modernism: Towards A Multicultural Paradigm Shift in The Social Sciences, Global Civil Society Yearbook, London: Sage Publications, 2004, pp.40-58. The main tool in this regard is international law in addition to advocacy, monitoring, and accountability, especially within the framework of the United Nations; all of which fall squarely under the framework of the Nation-State. This trend was established by Mohamed Al-Sayed Saed. His interventions were the most important stream within that trend. He managed, along with a group of researchers, albeit in the discipline of philosophy, in making CIHRS with its activities and publications, a space for thinking and intellectual deliberation. His openness as a thinker and an organizer allowed dialogue, and the reception of voices from across a wide spectrum, in events CIHRS hosted.8For more on the role and influence of Mohamed Al-Sayed Saed, see a special issue of Ruwaq Arabi, the periodical he had founded atCIHRS:www.cihrs.org/?p=5225 رواق عربي، عدد تذكاري، محمد السيد سعيد، العدد 53، 2010، متاح في It is noteworthy that Saed was keen since his early writings in the 1990s, to elaborate on the relationship between Islam and Human Rights. He published a paper in the mid-90s in the first volume of Ruwaq Arabi. Before he died, he published a paper about an Islamist project rooted in the Palestinian cause, for world peace. He did not possess, however, enough religious knowledge to engage with the problematics that rights groups pointed out in the Islamist approach. His work is, thus, ‘about’ the issue, not substantially engaged with the issue.9The author was keen to mention this first study, but she was not able to access the first issue of Ruwaq Arabi. However, she has a digital version of Al-Sayed Saed’s last study, entitled “Islam and World Peace” on Madarek, which was part of Islamonline portal. The study is not available online anymore since the portal was closed sown in 2010. A detailed academic study about the work of Al-Sayed Saed is Ahmed Menissi’s PhD dissertation written at the Arab Studies Institute in Cairo. The dissertation is reviewed at www.almothaqaf.com/a/b8/921595 It did not produce a paradigm shift for the parties concerned. Nor did it lead to consensus on commonalities, or an agreement on the possibility of collective work for the movements that remained adversaries for years. Each movement kept to its political and intellectual grounds, perhaps because the shift from the Left to the human rights sphere was the maximum distance most rights groups founders were able to cross ideologically and due to the fact that most were then no longer young.10The role CIHRS played in that direction merits a separate study. EIPR raised the conceptual and research standards in its reports and activities, to some extent. The intellectual space of rights platforms, however, was not able to keep up the level of conversation founded by Al-Sayed Saed, due to the absence of individuals who enjoy extensive relationships with various factions, with the exception of Ahmed Saif Al-Islam and Ahmed Nabil Al-Hilali, who both passed away and belonged more to the legal/rights circle, not the intellectual one. The problems with regarding Islam as a source of knowledge, not as a history and legacy, was a topic I discussed in many meetings with Al-Sayed Saed, through years of scholarly cooperation with him as of 2003 on a global civil society project, and until his death in 2009. Al-Sayed Saed acknowledged the need of ‘the rights movement’ to study the Islamic legacy more systematically. The same opinion was expressed by Al-Sayed Yassin before his death, throughout extended discussions. Some people managed to handle this challenge, intellectually, including Adel Hussien and Abdulwahab Al-Messiry, but extensive knowledge about the Islamicjurisprudence and other aspects of Sharia remainedlimited because of how hard it is to navigate an entirely new discipline characterized by different approaches and conceptions. Ideologically speaking, human rights actors suffered a hole in their critical approach. Their critique of Islamist discourse and scholarly tradition is not comparable to what they could have been able to achieve had they also critiqued the Western human rights paradigm. Their critical discourse had opted not to consider Islam a parallel universal human rights approach, nor to consider it a rival human rights approach. This is very different from what Anthony Chase, from the Western viewpoint, or Abdulaziz Sachedina, from an Islamist viewpoint presented in their works.11Anthony Chase, “The Tail and the Dog: Constructing Islam and Human Rights in Political Context” in: Amr Hamzawy and Anthony Chase (eds. ), Human Rights in the Arab World: Independent Voices, Philadelphia: University of Pennsylvania Press, 2008, pp.21-2; Abdulaziz Sachedina, Islam and the Challenge of Human Rights, Oxford: OUP, 2014, pp.3-40. The dominant critical discourse among Egyptian rights actors did not explore the specificity of the Western genealogy of the human rights discourse, as Talal Assad did, and how it revolved around the individual’s sovereignty in parallel to state sovereignty. The latter remained the ultimate reference under which the human rights logic worked in practice, despite hypotheses about the ‘Universality’ of these rights.12Talal Asad, Formations of the Secular: Christianity, Islam, Modernity, California: Stanford University Press, 2003, pp.134-158. Under such a framework, still, the state maintained the right to declare a state of exception at its own discretion (the sovereignty principle), and at such times all guarantees of rights are reduced to their absolute minimum.13[in Arabic] كارل شميت، مفهوم السياسي، ترجمة سومر المير محمود،مدرات للأبحاث والنشر، 2017، ص 51-76؛ جورجيو أجامبين، حالة الإستثناء: الإنسان الحرام، ترجمة د.ناصر إسماعيل، مدرات للأبحاث والنشر، 2015، ص 39-92. The proponents of the human rights system who adopt the Universal Declaration of Human Rights (UDHR) have simply turned this text into an ultimate reference. They assume that applying Shari’a, as Islamists demand, would inevitably erode citizenship; that reaching political power is the highest priority of Islamists; and that they are not really worried about human rights. While Islamists are criticized as being very ideological, most human rights activists describe Islamists as “Muta’aslimun[persons who manipulate Islam to their ends]”. They keep cautioning against the “despotism of the majority”, while also reminding everyone about the danger of Islamists, and that they are against freedom of expression, women rights, minority rights, and personal rights: as if the danger of the Islamist Ideology is the main challenge.14[in Arabic]معتز الفجيري، "استبداد الأغلبية: الإسلاميون وتقويض حقوق الإنسان"، في : بهي الدين حسن (محرر)، الدستور المصري الجديد يعيد إنتاج النظام القمعي القديم، مجلة رواق عربي، العدد 63، 2012، ص 53-84. In “After Evil”, Robert Meister noted that the human rights regime became an “Ideology” in itself. It is not about rights groups versus social and political movements. It is about a conflict between ideologies where rights groups cannot be categorized under the banner of, say, Liberalism. As such, rights groups occupy their own ideological niche.15Robert Meister, After Evil: A Politics of Human Rights, N.Y.: Columbia University Press, 2011. This is a very important point of departure if we want to ‘genealogically’ understand the rights movement. With this in mind, we can see how the pioneering human rights activists of the 1980s in Egypt moved from an ideological regime towards the human rights ideology, embracing relevant political positions and expectations from the political realm, and how it wishes to radically change this sphere, especially when engaging with Islamists. We can also see how far it accepts to adapt to the status quo, and to use the channels provided by despotic and totalitarian regimes to support specific rights agendas, especially women rights, as we will detail later this study. Meister also raised the question of the moral problematic when human rights is perceived as “post-religious”, if we may say so, since this exclusion of religion does not resolve the very problematic of the moral grounding of rights. Samuel Moyn suggests that the human rights movement is premised on an ethical promise that appeared after the political failure of grand ideologies rooted in the emergence of modern nation-states and born of the enlightenment era claims to universality. According to this understanding, universality should have founded “an international community” through the meeting of willing states. It is this very state that repeatedly violated the rights of citizens, and it is the same state that practiced sovereignty through waging wars of genocide, throughout the past decades and until the present. Therefore, the global rights movement was not able to break with political calculations, and it was not able to rise above them. Moyn, through an elaborate analysis, suggests that the quest for universality and attempts to tackle recurrent genocides contributed to the development and the rise of the concept of “transitional justice”. It is a concept that the global human rights movement saw as combining an ethical essence and the possibility for engaging justice in through negotiations, rather than radical interventions.16Samuel Moyn, The Last Utopia: Human Rights in History, London: Belknap Press, 2010. The insistence of Egyptian and Arab rights groups on a “borrowed” universality that lacks fresh contributions to the critique of this universality or questioning its concepts, led them to occupy the space of deliberating on the dangers of Shari’a, instead of critiquing the philosophy of the state.17Upon reviewing the Ruwaq Arabi periodical between 2012 and 2017, we found four issues, beside the essays across other issues, dedicated to criticising and analysing the performance of Islamists. See: الإسلام السياسي أمام اختبار الديمقراطية وحقوق الإنسان، عدد رواق عربي 60 ، تشرين الأول/أكتوبر 2012؛ حقوق الإنسان والقانون الإسلامي… تعارض أم توافق؟-عدد رواق عربي 64، أيلول/سبتمبر 2013؛ أي مستقبل لجماعة الإخوان المسلمين – عدد رواق عربي 65-66، خريف 2013؛ جماعة الاخوان المسلمین والثورة المصریة… مراجعات لم تجرى بعد،عدد رواق عربي 70، نيسان/أبريل 2017. These rights groups do not give Shari’a enough credit as part of the cultural tradition that formulated perceptions of “the legal”.18See: Lawrence Rosen, The Anthropology of Justice: Law as Culture in Islamic Society, Cambridge: CUP, 2008. And while they had effectively chosen, as stated earlier, to be elitist and stay away from populism, they did not succeed during the popular uprising post January 2011, or after the brutal removal and neutralization of the MB to lay down deeper roots and move from the space of organizations to the realm of movements. Islamist movements had also failed in institutionalizing their rights-based activities, that were exclusively concerned with the cases of their own members, beside their initial inability to conceptualize the ‘political’, ending up in a state of confusion torn between utopian ideas and pragmatic actions. Since the 1980s, social sciences researchers differentiated between old and new social movements. Labour movements were considered a classic example of old movements that are based on extensive recruitment with strict membership roles; they are hard to leave; they live long, they use strategies of mobilization; and are based on an ideological vision and a hierarchical structure. Islamist movements are thus an old social movement given the common characteristics. The new movements are the ones that revolve around specific demands that they are formed form to push for; they resort to innovative means for mobilization that do not rely on membership, while relying sometimes just on support functions and advocacy activities; they change their goals more flexibly; are not grounded in rigid ideologies; and it is hard for them to enter alliances, to merge, or transform their nature.19Claus Offe, “New Social Movements: Challenging the Boundaries of Institutional Politics”, Social Research, Vol.52, 1985, pp.817-868-. ; Nelson A Pichardo, “New Social Movements: A Critical Review”, Annual Review of Sociology, Vol.23, 1997, pp.411-430; David Plotke, “What’s So New About New Social Movements?” Socialist Review, Vol.20, 1990, pp. 81-102. There is a body of literature that criticizes this rigid dichotomy. It considered that class and social divisions, which social movements formed to challenge, changed in nature as modernization evolved and globalization spread. Therefore, both old and new movements alike are facing a new reality that pushes them towards new protest tactics, in the context of shifting lines of separation between the two categories. This also led to a whole new plethora of mobilization tools, means of practicing opposition, and the extension of alliances beyond borders. The old and new movements also started attracting a plurality of classes. They are not closed as before to any specific community, faction, or class.20DougMcAdam, Sidney Tarrow, and Charles Tilly, Dynamics of Contention, Cambridge: Cambridge University Press, 2001. A third categorization soon made its entry: the “non-movements”. The most prominent scholar who applied the concept to the youth protests in Egypt and Iran is Asef Bayat. Such protests are spontaneous and use innovative and diverse modes of mobilization with sustained pressure that seeks to induce change. Non-movements disappear, leaving behind pools of expertise that help form new non-movements without necessarily repeating earlier patterns. This is something Bayat also described as: Street politics or daily life politics.21Asef Bayat, Life as Politics: How Ordinary People Change the Middle East, 2nd edition, California: Stanford University Press, 2013. What concerns us here is to try and gauge the contours of rights groups and socio-political Islamic movements. Various rights organization appeared in the mid-1980s. The first one was the Egyptian Organization for Human Rights. Years later, the CIHRS was founded in 1993. The Arab Network for Human Rights Information (ANHRI) was formed in 2004. Many organizations and associations appeared, and some of them concerned themselves with specific themes, like women or labour rights. It is hardly possible to say with any certainty that there is an organized movement for human rights in Egypt. We can, however, refer to how these organizations, combined, approach the concept of new social movements of “limited size”, that lack a considerable societal backing in comparison to the Islamic movement (the MB in particular). It is not necessary to even compare the size of membership and capacity to mobilize between the two sides; the rights groups and the Islamist movements. 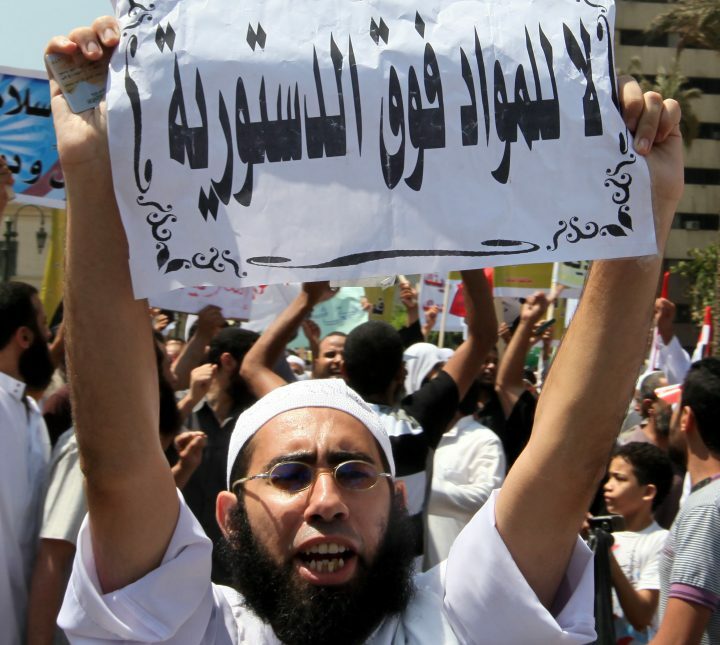 The Islamist movement engaged formal political action within partisan politics since the mid-1980s. They politicized civic and professional unions after controlling their boards. Rights groups, on the other hand, kept moving within the civil society framework. Some of them became active on the international level through conferences and global rights coalitions and networks. This difference in structure caused a perpetual tension in the relationship between the two categories of actors, even when they cooperated to coordinate protests after the 2003 US invasion of Iraq. That moment mobilized the public sphere to some extent, and “Kefaya” movement was created. Throughout the years, the substantial weight and influence of the Muslim Brotherhood remained the reason for this movement to resort to independent one-sided decisions that clashed with agreements reached at the street level among grassroots. It kept justifying this by stating that it was the movement that had paid the highest price in confrontations, a position that it thought gave the movement the right to last-minute changes in agreements in certain situations. This disparity, and contradiction sometimes, between the structure and weight of the two groups of actors, the Islamists and the rights-based groups, had its repercussions on the nature of the relationship between the two sides. It also affected the chances of defending common interests by seizing available political opportunities. Tarrow assumed that movements usually seek to push their demands forward whenever an opportunity appears in the political arena.22Sidney Tarrow, PowerinMovement, Camridge: Cambridge University Press,1994, p.85. There are no clear ways to map such opportunities or to measure the odds of success or failure in the case of authoritarian regimes. In this regard, Tarrow and Tilly noticed that conditions through which social movements harvest gains from political opportunities, does include the plurality of power holders in the regime, the instability of ruling political coalitions, and the openness of the regime to include new players.23Charles Tillyand Sidney Tarrow.Contentious Politics, Oxford: Oxford University Press. 2006. These are conditions not available in totalitarian regimes. As such, instead of “taking advantage of available opportunities”, “opportunism” prevailed among various actors, who sought to present themselves to the political authority as replacements for the other group of actors, in spite of the disparity in their influence.24In the field of women rights, for example, Tahani Al-Gibali, who was about to establish an Egyptian Women Union in 2000, and the trade unionist leader and leftist journalist Amina Shafiq, both joined the National Women Council under first lady Suzan Mubarak, during the last years of Mubarak’s rule. They had both accepted to work under the banner of a state experiencing a legitimacy crisis, within an organization formed by the state to undermine autonomous women groups, similar to what the state did with the manipulation of the National Council for Human Rights later on (NCHR). See: Heba Raouf Ezzat, “The Silent Ayesha: An Egyptian Narrative Globalization, Gender, and Religion”, in: Jane Bayes and Nayereh Tohidi (eds. ), Globalization, Gender, and Religion, London: Palgrave Macmillan, 2001, pp. 231-257. This aborted, over the last 30 years, the opportunity to build broad coalitions. It undermined trust between civil and political actors, and contributed to the absence of a culture of negotiation and long-term dialogue among various actors in the civil and political spheres.25On the crisis of political negotiation among Egyptian political opposition factions, see: Heba Raouf Ezzat and Aly El Raggal, “Can a Revolution be Negotiated?”, in William Zartman (ed. ), Arab Spring: Negotiating in the Shadow of the Intifadat, Athens/US: Georgia University Press, 2015. For almost anyone who had a direct experience with both rights’ activists and Islamists, there is a clear difference between the two factions both in everyday practices and lifestyles. This is something that remains unstudied in the literature addressing the tense relationship between the two factions. This behavioural difference was not altered by the golden opportunity provided by the January 25threvolutionary moment, nor by the 18 days following days in Tahrir square - with what that entailed in terms of crossing borders between the two groups, and standing on common grounds in terms of dreams and struggles. Becoming part of the square did not depend on the ideology one believed in; it was thus a good opportunity to build a new map of relationships and coalitions. However, soon after the parties became divided because of the proposed constitutional amendments, the moment of the square was lost for good. Rights groups were present in the square as individuals, and not under their organizational banners. This was the right measure and in line with their professional and impartiality prerogatives as defenders of human rights. However, many prominent figures in these groups adopted anti-Islamist public positions early on, and they joined certain camps in various political situation. In other words, they crossed the line between professional neutrality and direct intervention. This made these groups and those defenders look as if they were both the monitor and the adversary at the same time. Meanwhile, daily hostile verbal exchanges between Islamist activists and rights actors flared up from 2011 to 2013. This led the grassroots level of the Islamist movement to see enemies in the rights groups, except for figures that steered the relationship wisely and fulfilled their roles as rights actors without entering the direct political struggle arena. Ahmed Saif Al-Islam was the most prominent example of such people. The Islamists went really far in smearing prominent figures in the rights groups, especially after the Ittihadiya presidential palace confrontations. This went as far as sourcing and then disseminating private videos of prominent rights’ activists and their private social events in order to discredit them and question their ethics. Young Islamicists for example widely posted personal videos for Gamal Eid on twitter). Enmity and the search for opportunities of doing harm went even as far as archiving positions of prominent rights activists on Twitter and Facebook, starting January 2013. These positions were later used against those who supported public protests on 30thJune (these were demonstrations against President Mohammad Morsi and the MB) when they condemned Rab’aa and following massacres, to remind them that they supported protests that ultimately “betrayed the democratic process in July 3rdand as such have some of the blood spilled on their hands”. In return, the MBs are reminded of Ittihadiya Presidential palace events half way through Morsi’s one year in office and of their demonstrators who used verbal violence against their adversaries in the street, and how they physically assaulted them in some situations, which led to injuries in various governorates, especially Alexandria. Another recurrent narrative is the condemnation of how the MBs betrayed the revolution and hijacked it since the 18 days in Tahrir square, no less, when they communicated with the, then head of the Intelligence Service, Omar Soliman, and of how they then took over as the main player and excluded others, how they mobilized and resorted to shows of force in the elections, then “betrayal” in Mohamed Mahmoud events between largely secular protesters and security forces, how they monopolized decision-making through the Parliament, while drafting the 2012 Constitution, the Morsi Constitutional Declaration, etc. Some even insist, while condemning Rab’aa massacre as a central and symbolic tragedy of the Muslim Brotherhood, on hinting at how the sit-in included armed persons and that the MB was exploiting the death of their supporters. So, while MB young activists commemorate the Rab’aa massacre, young rights activists commemorate the Mohamed Mahmoud and Ittihadiya events, and so on and so forth in a vicious circle. Mustonen tried to explore the perspectives of “lifestyle” and their influence on political adversaries and how the upper cosmopolitan class became hostile to the January 2011 revolt especially after the Islamist rise, given the big differences in their everyday lives, and imagining Islamists as “others”, who do not represent the ‘real’ Egypt.26Liina Mustonen, “Cosmopolitanism and its Others:Social Distinction in Egypt in the aftermath of theRevolution of 2011”, Thesis submitted for assessment with a view to obtaining the degree of Doctor of Political and Social Sciences of the European University Institute-Florence, 31 May 2017. It is possible to conduct a similar comparison through another study, about the role of differing lifestyles in creating an adversary relationship between rights groups and Islamists. There is no systemic or rigorous research of this renewed animosity, on the level of the personal consciousness, within the ranks of both parties. The author, however, given her involvement in following social media platforms for years, possesses many examples that are relevant to how this relationship was influenced in the virtual/personal space. Such a space will need more discipline, and will be one of the hardest reconciliations ahead, in terms of managing and controlling, when the moment comes, in the future, for the sake of a general civil reconciliation. The Islamist movement, as a political faction, with the Muslim Brotherhood at its heart, was not particularly occupied with organized and institutionalized human rights work. For decades, the movement suffered systematic violations and persecution, since the assassination of its founder, Hassan Al-Banna in 1949, then throughout Nasser’s conflict and repression with the MB after the 1952 Revolution. The MB rights advocacy was channelled through professional unions, especially the Bar Association, followed by solidarity from the Engineers and Physicians Syndicates with their detained members. Before 2011, there had been a sustained dialogue between the MB and human rights organizations to document (and/or campaign against) violations, detentions, torture, and military trials. Three organizations with Islamist links were established in the early 2000s to work on human rights. The first one was Sawasiya Center, that was founded in 2004 and stayed active until 2013, when its founder and director, lawyer Abdelmon`iem Abdelmaqsoud who belonged to the MB, was arrested. Sawasiya issued many reports documenting various types of violations, including against students; it monitored and exposed violations in parliamentary and professional unions elections; it documented police actions, violations against Egyptians abroad and the Palestinians under occupation, and Muslims in the West. Sawasiya stayed removed from the concerns of other rights groups, because of ideological conflicts and the fact that it was mainly concerned with cases of detainees and torture cases. It did not challenge or contribute to a broad conception of the human rights agenda especially when it comes to basic citizen or labour rights.27See Sawasiya Center’s mission statement. Its Facebook page goo.gl/dmZJhz is no longer active, nor its webpage. The author knows about its activities since it was founded, because she used to receive its publications since its activities became systematic. It is perhaps useful to trace the contours of conflict between rights defenders and Islamists (MB at the forefront of the latter group) after 2011. In this conflict, the crises were recurrent, and their details reflected the dynamics of the uneasy relationship between the two groups. The first disagreement within the political and rights arenas was centred on the 2011 Constitutional amendments. Some Liberal and Leftist groups stressed the need for a new constitution. The Islamist movements, however, preferred a restricted amendment for the constitution and to work on a new constitution later on. The Supreme Council of the Armed Forces (SCAF) first promised an amendment through a complementary constitutional declaration but then after a referendum supported these specific amendments the SCAF added many articles that were not part of the original document voted on and issued an almost new constitution. Though the SCAF, thus, made it clear that its authority rises above that of the voters and the constitution, the quick developments and conflicts among other political actors did not allow for a serious alignment, in one camp, strong enough to confront the SCAF. The political events of 2011 and 2012 moved fast and in an intensive manner until June 2013 when the military seized power with the support of civilian factions, the Grand Imam of Al-Azhar and the Coptic Pope. Not all events constituted sites of conflict and disagreement between rights organizations and the Islamist movement. Some of the individuals belonging to both camps differed regarding their positions in street protests, shared demonstrations and clashes. They engaged in verbal attacks through social media platforms. There were not any major events, however, before the deadly protest of Mohamed Mahmoud, except for the Maspiro Massacre of Coptic protesters that the Church opted to ignore and avoid a confrontation with the SCAF. It is important to focus some attention on the trajectory of fact-finding commissions that started in this period. Such commissions constituted an important route within the shaky process of transitional justice, but they were part of the tool box that the MB ignored. The MB did not have a clear strategy for the evolving situation and whether they should follow a path of retribution (Qissas)or resort to amnesty? Due to this confusion, no single death penalty was issued in cases against those who killed protestors and were convicted in fair trials. www.almasryalyoum.com/news/details/126472 Some of the accused were arrested, but several years afterwards there was no retribution for the martyrs of the revolution and consequent protests. It might not be a surprise that SCAF did not provide redress for those killed, since it might have colluded with the police and remnants of the fallen regime since day one of the uprising, but it was surprising that the MB opted to ignore the damning reports of successive fact-finding missions under President Morsi. The MB position towards human rights when they won a majority of seats in Parliament and then the Presidency is unjustifiable not because of its political ramifications and the negative implications for human rights in general, but also because it contravened with the Islamist criteria that they explicitly adopt as their reference. We will study four important milestones in the following paragraphs: the Mohamed Mahmoud protests of November 2011, the Ittihadiya clashes in late 2012, a few months after Morsi’s term in office started, the 30 June and 3 July 2013 protests and military takeover, and then the Rab’aa Massacre and the crises that followed. We will use these milestones to shine a light on the turns and twists of the relationship between rights groups and Islamists, especially the MB. The protests were examined by a fact-finding committee that President Morsi decreed to investigate the events from January 2011 to June 2012, the date he took office. Ahmed Ragheb, a rights activist and a member of this committee, said their report that was to be sent to the President in early January 2013 included a lot of new evidence that would have led to reopening trials “provided that there was the necessary political will”. The report took about six months to prepare by 17 fact-finding teams confirmed, according to Ragheb, the involvement of police and military personnel in using live ammunition and birdshots against demonstrators. State agencies and government-owned TV declined to share evidence they had regarding the killing of protestors. The report indicated that the tear gas used by the police forces during the protests killed several demonstrators by suffocation, because the police violated pertinent rules of engagement and use of gas. The main objective of the Islamist Movement in 2011 was to ensure that parliamentary elections are held. But after they secured their landslide victory, this Parliament did not hold for long. Conflicts erupted about the Constituent Assembly that was chosen then dissolved, only to be formed for a second time to the renewed dissatisfaction of some parties. In what follows, we focus on the performance of the so-called “Parliament of the Muslim Brotherhood”, with respect to human rights issues. We will address three important cases: Port Said stadium riots, NGOs Law, and enforcing international Human Rights mechanisms. In summary, this political roller coaster produced more disagreements and discord among various political factions. The parliament was dissolved before Morsi came to office. The fact-finding committees he established did not yield any results on the fate of detainees, whose whereabouts were unknown, nor on accountability for the violent acts that occurred since January 2011. The Committee on detainees did not achieve what it set out to do, primarily accounting for the fate of all detainees and ensuring their release. The fact-finding committee on violent acts submitted a report to the presidency but President Morsi refused to publish it. In April 2013, the Egyptian Shorouk and the British Guardian, published excerpts from a leaked copy of the report on the illegal use of live ammunition by the police, and torture against demonstrators detained by the army. Bakinam Al-Sharqawi, a President’s Assistant, invited a group of rights advocates to an extended discussion, over several rounds, about how to reform the Ministry of Interior, especially the members of the National Initiative for Police Reform (NIPR) that took off in 2011.53See the initiative website at www.policeforegypt.org/honors.phpWhen Morsi suddenly issued a Constitutional Declaration, various political actors protested the presidential performance and soon thereafter supporters and opponents clashed at the presidential Ittihadiya palace. This led the rights advocates to withdraw from the dialogue with the presidency. During the Ittihadiya events, MB supporters attacked the tents of peaceful protesters camped in front of the presidential palace. After many hours, more MB opponents and proponents came to the area and clashes broke out. Thugs escalated the situation and tried to break into the palace in what some MB members described as the first coup attempt against president Morsi. Eight MB supporters were killed. The ninth death was that of opposition activist Al-Husseini Abu-Deif, for whose murder the MB was blamed. goo.gl/BSDTzX With their long experience in documenting violations by security agencies, they should have been aware of how such practices were committed by police and army personnel. Such an understanding would not fully exonerate the MB from using violence in some confrontations with revolutionary movements. Consequently, they should not have believed each and every accusation against the MB, especially when these allegations came from their nemeses or lacked any credible evidence. The Rab’aa massacre was a milestone at which rights groups and advocates returned to their position of opposition to the regime after a period of oscillation and volatility following the coup of 3 July. The coup was followed by recurrent massacres from the Republican Guard barracks to the Military Parade Platform where people were killed by the Army and the Police, before reaching the dramatic turning point of Rab’aa and the bloody protests at Al-Fath mosque. goo.gl/mQ9Kmp They called upon him to increase the representation of women and hold all those who committed crimes against the country under Mubarak, SCAF, and Morsi, accountable, and ensuring that the police forces are restructured. “While stating our concern over the growing political role of the military institution, at the expense of democracy and national security process,”. It was naïve that these organizations expected from interim President Mansour to rein in the army. These organizations and many influential figures in them themselves suffered, months later, from government retaliation (e.g. : Azza Soliman was charged and released on bail while Mozn Hassan was banned from traveling. This regime that brutally killed and detained Islamist women activists did the same to revolutionary activists like Mahinour Al-Masry and others. goo.gl/HUdxNT Four months later, many of these Egyptian rights groups, were joined by Human Rights Watch, in a statement: “Egypt: No Acknowledgement or Justice for Mass Protest Killings, Set Up a Fact-Finding Committee as a First Step”. The groups demanded, once again, the formation of a fact-finding committee, but they also included some crimes that go as far back as 2011. The demands recurred,60See “Weeks of Killing: State Violence, Communal violence, and Sectarian attacks in the Summer of 2013”, EIPR, 18 June 2014. It covers the events of political violence in the weeks before and after removing Morsi in July 2013. It held the state as the actor mainly responsible for what could be the worst acts of violence in modern Egypt, as thousands of people were killed or injured. EIPR sent the report to the government “Independent National Committee for Collecting Information and Evidence, and for Fact Finding, that came with the 30 June 2013 revolution and the events that followed”. Available at goo.gl/doMMpa which explains the increasing harsh regime measures against the rights groups since it feared international accountability mechanisms that could have viewed Rab’aa a crime against humanity. See also statements by NCHR member Gamal Fahmy who supported the report, claiming that it was the only “credible source out there”, and as such questioning the credibility of international reports. He also described the sit-in as “an armed mutiny”. See: "القومى لحقوق الإنسان": تقريرنا بشأن فض تجمع رابعة المسلح من أهم انجازاتنا"، اليوم السابع، 10 أيلول/سبتمبر 2016. Human Rights Watch issued a detailed report a year after the Rab’aa Massacre.64See: “All according to Plan: The Rab’aa Massacre and Mass Killings of Protesters”, Human Rights Watch Report, 12 August 2013. Available at: www.hrw.org/ar/report/2014/08/12/256580 This deeply angered the regime which had since discredited HRW reports while banning the organization’s activities in Egypt, and then in 2017 it blocked access to HRW website in Egypt. The government sought to bring rights groups under full control after July 2013, so that all reports by domestic organizations could become consistent with official position, and to avoid information on grave human rights violations reaching European embassies or international rights groups. The regime worked to expand the remit of military tribunals.65See in Arabic: "خمس عشرة منظمة ومجموعة حقوقية مستقلة تنتقد توسيع اختصاصات القضاء العسكري"، 30 أكتوبر 2014، متاح على www.cihrs.org/?p=9633 Legal harassment of domestic rights organizations continued. In March 2016, investigations into foreign funding to rights NGOs restarted with the claim that new information surfaced about certain NGOs and public figures receiving funding from abroad. Fourteen human rights groups asserted that the aim was to punish civil society organizations, especially as the investigating judges worked to freeze the assets of several human rights defenders and organizations, dissolving NGOs, and travel bans for many individuals.66See in Arabic: "استمرار مطاردة المدافعين عن حقوق الإنسان واستهداف عمل منظمات المجتمع المدني"، 23 نوفمبر 2016، متاح في goo.gl/uwPFVH Rights groups kept monitoring violations, including torture and enforced disappearance. But with the increasing caseload and the multiplicity of violations, thematic reports started to be issued, as organizations sought to largely document and publicize having lost almost all tools to change the reality or impact the state behaviour. According to the theory of political opportunities, it should be noted that the hardest barriers to seizing opportunities is the prevailing political culture.67David Meyer and Debra Minkoff, “Conceptualizing Political Opportunity”,Social Forces, Vol.82, No. 4, June 2004, pp.1457-1462, 1480-1485. This usually shows in the inability to deconstruct the opportunity to its many levels and components, with the inclination to perceive it as a zero-sum game. The temporal dimension of the opportunity become absent, with the impossibility of analyzing the components of the opportunity or to rightly perceive its various trajectories and their relative speeds. Some actors can make gains on the short run without necessarily losing medium and long-term opportunities. However, this does not happen because of hastiness and the absence of strategic thinking that can determine a collective interest of civil actors (secular and Islamist alike), given that the relationship between the two is rooted in competition rather than conflict. The trajectory of recent events, given the long contentious relationship between the generation that established the Egyptian Organization for Human Rights on one hand and the Islamist movement, primarily the MB, on the other hand, shows that all actors took advantage of available political opportunities with a high degree of pragmatism, short sightedness, and obsession with short-term gains despite the largely obvious long-term negative consequences. This was partly caused a conflict approach dominated rather than a rational approach to build on common grounds, share gains, or expand the possibilities of mutual benefits. They both ignored that the military became the only winner as it captured the state even when Morsi was still a president in Ittihadiya palace unable to enforce his decisions while being surrounded with agencies whose senior officials admitted after 2013 that they did not cooperate with him on purpose. (Why the MB insisted to stay in “power” in the presidential palace despite all this and what kind of psychological, cultural and political motivations that went along with this position, is an issue that deserves a separate paper). The available political opportunities at the time were not seen by almost everyone as opportunities that can be a subject of negotiations. All political actors failed to reach a lowest common denominator or clear rules for a political management of the volatile situation.68Regarding the inability to craft mechanisms of negotiation that follow clear rules, and the mistrust between civil and political actors after 2011, see: Aly El Raggal and Heba Raouf Ezzat, “Can a Revolution Be Negotiated”, in: Arab Spring: Negotiating in the Shadow of Intifada, London: The University of Georgia Press, 2015, pp.80-115. There is no doubt that the cleverest actor on the political scene for decades was the state, despite the regime change through the 25 January Uprising. The decisive factor has always been its reliance on the factors of speed and surprise, while using legal tools to undermine justice. The state engaged this existential conflict as if it were an actual war. It deployed tactics to disperse coalitions, co-opt political actors, isolating individuals and disbanding the masses. This “speed management” by the state using the tools of the sovereign dominated the civil space all the time. It crafted society in its image. And instead of “the right to a State” as an essential right, the State apparatuses, through its sovereign, cultural, and media arms, preoccupied actors with many small battles that lasted for limited periods of time. As such, it pushed them to lose sight of the need to align on overarching objectives and non-negotiable rights in the long run. It pushed the masses away from the streets into closed spaces each and every time people occupied the streets. They were either taken to prison or meeting rooms for an exercise in co-optation. In wars, manoeuvring spaces are decisive. Attack and defence are strategic skills. The battle ground of civil liberation wars is the city, where the authorities divide up connecting spaces using walls and fences, deploy soldiers throughout, arm policemen to the teeth, send elite troops to public squares to patrol, and ultimately ensure surveillance system are in place for real and virtual spaces. How is it possible to cross these gaps and get over that animosity for a better division of labour in the civil and political arenas? Actors in these arenas have become united under harsh state measures of dispersion, confiscations of money, brutalization behind bars, and unfair judicial verdicts? What are the issues that all such actors can cooperate on and pool together their expertise in documenting violations and ensuring accountability and justice, in the future? It is of critical importance to understand that the Nationalistic Imaginary that became primarily obsessed with the state as a framework, or with governing as an end in itself, neglected the crucial factor of the nation-state, which is territory. There is no possible ‘common ground’ in the civil arena without a territory in the geographic sense. This does not only refer to public space, but also to territorial integrity and defending the People’s sovereignty over it. We thus move from the civic and political rights coding to a perspective that starts with the right to the street, to the city, and to the state. The second issue around which various faction can align is the right to the city; this is the right to the grounds on which citizens stand, and the lands they own, with what both rights entails in terms of services and access to public space in everyday life.70It is important to understand everyday life as a field of contestation with the powers over historic right, per se, and not just contestation of the physical rights. See Agnes Heller’s important and relevant work: Agnes Heller, Everyday Life, London: Routledge and Kegan Paul, 1970. The challenge various actors face is the ongoing ‘war’ against civil space and the poor in the city.71One of the most important papers in this regard is Henri Lefebvre’s book on the critique of everyday life, and ‘occupying time’ and Richard Sennet’s work on using ‘informality’ in resistance. See: Henri Lefebvre, Critique of Everyday Life, translated by John Moore, London: Verso, 1991; Richard Sennet, The Uses of Disorder:Personal Identity and City Life, N.Y.: W.W. Norton, 1992. Efforts are underway to reinforce an apartheid-like structures in Egyptian provinces with clear discrimination in space, based on the two factors of wealth and arms.72Stephen Graham’s understanding of the militarization of cities is taking shape in Cairo and in other bigger cities, and of course it is happening in Sinai, while noting the particularity of its situation. And it is happening fast. See in Arabic:ستيفن جراهام، مدن تحت الحصار: فضائح العنف العسكري وعسكرة التنظيم المدني، ترجمة ميراي يونس، شركة المطبوعات للتوزيع والنشر، 2013، ص ص 43-90، 503-547. The most prominent and clearest example is the New Administrative Capital that is being built as a “Green Zone”, where there will be a concentration of wealth and arms in one place, while delineating various spaces in the ‘old city’ and ‘gated communities’ to create distinct lines between the wealthy and the rest.73Regarding the New Administrative Capital and the Military mentality, see: Ursula Lindsey, “The Anti-Cairo”, Places Journal, March 2017. Meanwhile, a new and different generation is rising in terms of professionalism and ideological anchors; it is distinct from the older generation of rights advocates and the previous generation of the 1970s. This generation consists of development and community activists, as well as architects and social science researchers who attach a great significance to the right to place, city, and territory.74Roman Stadiniki,"De l'activisme urbain en Egypte: émergence et stratégies depuis la révolution de 2011", Echogéo,Vol.25, 2013, available at echogeo.revues.org/13491. (See English translation by Oriental Institute-Beirut at goo.gl/h6ta1f) Yes, the housing rights were long on the agenda through the efforts of UN-Habitat in Egypt, and they became prominent and more visible when debates flared around issues related to combatting poverty or promulgating a new law to organize old controlled housing rents. Still, the new initiatives became more focused and shone a light systematically on specific issues. For example, the Urban Solidarity Initiative was established in a collaboration between Takween Integrated Community Development and the American University in Cairo (AUC)with support from the Ford Foundation and the Norwegian Development Fund. The initiative has sought to document urban transformations and raise awareness about the right to public space in urban areas since 2009. Simultaneously, the Urban and Environmental Studies Lab/Initiative has been focused on developing downtown Cairo, then its focus was broadened to include local initiatives of urban development, and to create transdisciplinary spheres for studying urban development and related rights. Then came the “10 Tooba: Applied Research on the Built Environment”, which is a specialized group concerned with issues of urbanism, linking them with architectural and urban planning. This group has accumulated expertise on urbanism and participatory planning, and on rights and politics of urbanism, through projects in urban communities in Egypt. It was founded in 2013 by a group of architects and activists, who established the Built Environment Observatory. There was also some networking to establish the “Shadow Ministry of Housing”, to monitor policies and raise awareness about housing rights. It is notable that all of these efforts are dedicated to the rights land, housing, and space, and that they monitor transformations in various provinces. This is beside the prominence of the right to housing issues in the activities of EIPR, the Egyptian Commission for Rights and Freedoms, and other rights groups. Mada Masr and other web-based conventional and social media have dedicated substantial efforts to relevant monitoring and investigative reporting. There is a rising tide of young rights actors from outside the established groups, after the 25 January Uprising, especially after July 2013. They came off street activism, and from new efforts to document violations and follow up on the cases of detainees and torture. So, beside the activists of “No to Military Trials”, the role of the Association of Freedom of Thought and Expression (AFTE) became prominent, and it attracted many young activists. The Arab Foundation for Civil and Political Rights Nidal was established in 2013, to be soon followed by the Egyptian Coordination of Rights and Freedoms in 2014, the Egyptian Commission for Rights and Freedoms, and Adala Center for Rights and Freedoms. Outside Egypt, Human Rights Monitor was established in London, in 2014, and it is mainly concerned with Egypt. The Geneva-based Adalah Committee was founded in 2015. It has a broad interest beyond monitoring violations measured according to standards of free trails and fair laws. There are also many relevant Facebook pages against military trials, enforced disappearance, executions, and torture. The first platform among those is No to Military Trials,75See the website and facebook page for “No to Military Trials” at www.nomiltrials.org and goo.gl/rjybcf then Break the Cuff76The dormant twitter feed of this group can be reached at @breakcuffsegy and others. These transformations that took off with the 25 January Uprising, and right after, pushed a new agenda and new generations into rights spaces that became broader and closer to following everyday violations. It created a new generation, and a new pattern of rights groups more responsive to current threats and violations, with varying degrees of politicization and of how far they can confront the regime. This is a historic opportunity to rise above the conflicts between Islamists and rights groups; these conflicts are anchored in ideological differences as well as personal conflicts within the 1970s generation.77Hassan believes that defending MB members should be an ethical duety. However, there is no theoretical framing available to establish an Arab concept for such ethics. This is due to the lack of interest and ability to theorize on human rights within the Egyptian rights community. See: Bahey el-Din Hassan, “A Question of Human Rights Ethics: Defending the Islamists”, in: Amr Hamzawy and Anthony Chase (eds. ), op. cit., pp. 38-48. We have a prominent example for the possibility of cooperation among organizations, domestically and abroad, and the possibility of creating coalitions and coordinate efforts. The mobilization over the arrest of lawyer Ibrahim Higazi, who took part in establishing “Families of the Forcibly Disappeared” after the disappearance of his son during the Republican Guard events in July 2013. This international mobilization led ambassadors of the U.K., Germany, Italy, and the Netherlands in Cairo to issue a joint statement expressing grave concern over Higazi’s detention. Regardless of how Higazi’s and the other cases evolved later, these opportunities as suitable points of departure to develop rules and ‘traditions’ for repeated and systematic cooperation, might open the door for more coordination and collaboration. It might prove to be a source of more professionalism, with focus on rights activities utilizing domestic and international mechanisms, away from politicized contentious positions of individuals within the field. This cooperation is necessary, now more than ever, given the Egyptian regime’s state of continuous and automatic denial of rights reports by international organizations about violations in Egypt; it is customary for the Foreign Ministry to work hard to discredit such reports and ban the relevant organizations from working in the country. Moreover, the regime has even started to suspect and even work sometimes to disable the very institutions that it had created and relied upon their reports as political tools, once it felt these institutions could gather evidence that can serve as ground for indicting regime officials in the future or expose them to international accountability mechanisms. goo.gl/QKQLik After the Rab’aa Massacre report, issued by NCHR, was utilized to confront international accusations, justifying the killing of civilians, and confirming allegations that MB members were armed in the Rab’aa sit-in, the regime now faces a report from the same Council that pointed at, even if in a very feeble way, rights violations by the state such as enforced disappearance. goo.gl/HpzvFG If this scenario takes its course, it will simply mean that the reports issued by NCHR were procedurally void and cannot be used by international bodies. Consequently, the regime had used the NCHR to counter rights groups for years and may now try to use it to avoid any measure of accountability bearing in mind that many of these rights groups were either shut down or are under strict surveillance. Such moves are not strange to a regime that had committed many crimes against unarmed and innocent civilians and then puts judges on trial because they helped draft an anti-torture bill.83HRW, “Egypt: Stop Retaliation for Anti-Torture Proposal”, 8 June 2016, available at www.hrw.org/news/2016/06/08/egypt-stop-retaliation-anti-torture-proposal Such a regime would not shy away from creating more fragile entities to defend its policies. Animosity was the keyword in the relationship between Islamists and rights advocates during the time of revolution. Islamists turned a blind eye to many crimes committed by the regime and its security agencies between 25 January 2011 and 2013. On the other hand, some rights advocates took part in mobilizing and supporting the Tamarodmovement that culminated in the demonstrations of 30 June 2013. They even supported the military seizure of power. However, the killings, executions, and other rights violations, then the direct confrontation between the regime and rights groups culminating in a more restrictive NGO law, led rights defenders to take a firmer position, by condemning the regime, and monitoring and documenting its violations. They even resorted to international advocacy, in various ways depending on the respective capacity of each organization, including those who stayed operational in Egypt and the others which moved abroad or were established outside the country. It is expected that this trend will push more Islamists, in the broader non-organizational sense, to see opportunity in resorting to human rights advocacy. As such, this will mean accepting more cooperation, especially in terms of monitoring and documenting, among the various initiatives and institutions established after 2013. Cooperation will be largely free from ideological conflicts and led by a new generation of actors. Based on the above, it is expected that the relationship between the Islamist movement, in a broad and loose sense especially after its crisis with the regime, and rights groups on the other hand, following generational and structural transformations, would become more collaborative in the next stages of domestic and international struggle for rights, after the death of politics and political parties. Collaborative work could focus on enforced disappearance, torture, and the death penalty. It might also include the right of return for the displaced people of Sinai, and accountability for crimes against civilians in the name of counterterrorism, in particular the military operation of the Armed Forces since February 2018. The preservation of life, in terms of survival with minimum living standards, could be among the priorities of cooperation to bridge the perception and framework gaps between the parties in the medium and long term. These priorities will furnish the common ground to hold efforts together and could create a larger base for the rights paradigm while giving Islamists the opportunity to apply an Islamic approach to human rights, a direction that they theorized about for too long. As such, a professional tract could open up for the Islamists allowing them a more credible and active role in human rights on the national arena. 1. ↑ [In Arabic] Yasmin Shash, “The rise, development and challenges of the rights movement in Egypt. Research papers”, Arab Reform Initiative, 4 August 2017. Available at www.arab-reform.net/ar/node/1095, pp. 3-4. 3. ↑ This paper is partially based on the author’s direct observations and her presence in some of the events over the last few years, as an active citizen in civil society, although she does not belong, organizationally, to any specific institution, party, or group. 5. ↑ The parliament exerted deeper and more extended efforts on this front, in comparison to those of the MB in Egypt. This includes, for example, efforts between 1978 and 1983, which were simply ignored and dismissed as part of former president Sadat machinations to contain and coopt Islamists. See also in Arabic:هبة رؤوف عزت، نحو عمران جديد، الشبكة العربية للأبحاث والنشر، 2015، ص 109-170؛ وجاسر عودة، الدولة المدنية: نحو تجاوز الاستبداد وتحقيق مقاصد الشريعة، الشبكة العربية للأبحاث والنشر، 2015، ص 7-23. 6. ↑ Intellectual voices within the rights groups studied the humanist stream within the Islamic tradition in the same way Leftists were interested in the material philosophy in Muslim history. See in Arabic:حسين مروة، النزعات المادية في الفلسفة العربية الإسلامية، دار الفارابي، 2002 (4 أجزاء)؛ عاطف أحمد (محرر)، دراسات في النزعة الإنسانية في الفكر الوسيط، ط2، مركز القاهرة لحقوق الإنسان، 2014. 7. ↑ Heba Raouf Ezzat, Beyond Methodological Modernism: Towards A Multicultural Paradigm Shift in The Social Sciences, Global Civil Society Yearbook, London: Sage Publications, 2004, pp.40-58. 10. ↑ The role CIHRS played in that direction merits a separate study. EIPR raised the conceptual and research standards in its reports and activities, to some extent. The intellectual space of rights platforms, however, was not able to keep up the level of conversation founded by Al-Sayed Saed, due to the absence of individuals who enjoy extensive relationships with various factions, with the exception of Ahmed Saif Al-Islam and Ahmed Nabil Al-Hilali, who both passed away and belonged more to the legal/rights circle, not the intellectual one. The problems with regarding Islam as a source of knowledge, not as a history and legacy, was a topic I discussed in many meetings with Al-Sayed Saed, through years of scholarly cooperation with him as of 2003 on a global civil society project, and until his death in 2009. Al-Sayed Saed acknowledged the need of ‘the rights movement’ to study the Islamic legacy more systematically. The same opinion was expressed by Al-Sayed Yassin before his death, throughout extended discussions. Some people managed to handle this challenge, intellectually, including Adel Hussien and Abdulwahab Al-Messiry, but extensive knowledge about the Islamicjurisprudence and other aspects of Sharia remainedlimited because of how hard it is to navigate an entirely new discipline characterized by different approaches and conceptions. 11. ↑ Anthony Chase, “The Tail and the Dog: Constructing Islam and Human Rights in Political Context” in: Amr Hamzawy and Anthony Chase (eds. ), Human Rights in the Arab World: Independent Voices, Philadelphia: University of Pennsylvania Press, 2008, pp.21-2; Abdulaziz Sachedina, Islam and the Challenge of Human Rights, Oxford: OUP, 2014, pp.3-40. 13. ↑ [in Arabic] كارل شميت، مفهوم السياسي، ترجمة سومر المير محمود،مدرات للأبحاث والنشر، 2017، ص 51-76؛ جورجيو أجامبين، حالة الإستثناء: الإنسان الحرام، ترجمة د.ناصر إسماعيل، مدرات للأبحاث والنشر، 2015، ص 39-92. 14. ↑ [in Arabic]معتز الفجيري، "استبداد الأغلبية: الإسلاميون وتقويض حقوق الإنسان"، في : بهي الدين حسن (محرر)، الدستور المصري الجديد يعيد إنتاج النظام القمعي القديم، مجلة رواق عربي، العدد 63، 2012، ص 53-84. 17. ↑ Upon reviewing the Ruwaq Arabi periodical between 2012 and 2017, we found four issues, beside the essays across other issues, dedicated to criticising and analysing the performance of Islamists. See: الإسلام السياسي أمام اختبار الديمقراطية وحقوق الإنسان، عدد رواق عربي 60 ، تشرين الأول/أكتوبر 2012؛ حقوق الإنسان والقانون الإسلامي… تعارض أم توافق؟-عدد رواق عربي 64، أيلول/سبتمبر 2013؛ أي مستقبل لجماعة الإخوان المسلمين – عدد رواق عربي 65-66، خريف 2013؛ جماعة الاخوان المسلمین والثورة المصریة… مراجعات لم تجرى بعد،عدد رواق عربي 70، نيسان/أبريل 2017. 18. ↑ See: Lawrence Rosen, The Anthropology of Justice: Law as Culture in Islamic Society, Cambridge: CUP, 2008. 20. ↑ DougMcAdam, Sidney Tarrow, and Charles Tilly, Dynamics of Contention, Cambridge: Cambridge University Press, 2001. 21. ↑ Asef Bayat, Life as Politics: How Ordinary People Change the Middle East, 2nd edition, California: Stanford University Press, 2013. 22. ↑ Sidney Tarrow, PowerinMovement, Camridge: Cambridge University Press,1994, p.85. 23. ↑ Charles Tillyand Sidney Tarrow.Contentious Politics, Oxford: Oxford University Press. 2006. 24. ↑ In the field of women rights, for example, Tahani Al-Gibali, who was about to establish an Egyptian Women Union in 2000, and the trade unionist leader and leftist journalist Amina Shafiq, both joined the National Women Council under first lady Suzan Mubarak, during the last years of Mubarak’s rule. They had both accepted to work under the banner of a state experiencing a legitimacy crisis, within an organization formed by the state to undermine autonomous women groups, similar to what the state did with the manipulation of the National Council for Human Rights later on (NCHR). See: Heba Raouf Ezzat, “The Silent Ayesha: An Egyptian Narrative Globalization, Gender, and Religion”, in: Jane Bayes and Nayereh Tohidi (eds. ), Globalization, Gender, and Religion, London: Palgrave Macmillan, 2001, pp. 231-257. 25. ↑ On the crisis of political negotiation among Egyptian political opposition factions, see: Heba Raouf Ezzat and Aly El Raggal, “Can a Revolution be Negotiated?”, in William Zartman (ed. ), Arab Spring: Negotiating in the Shadow of the Intifadat, Athens/US: Georgia University Press, 2015. 26. ↑ Liina Mustonen, “Cosmopolitanism and its Others:Social Distinction in Egypt in the aftermath of theRevolution of 2011”, Thesis submitted for assessment with a view to obtaining the degree of Doctor of Political and Social Sciences of the European University Institute-Florence, 31 May 2017. 27. ↑ See Sawasiya Center’s mission statement. Its Facebook page goo.gl/dmZJhz is no longer active, nor its webpage. The author knows about its activities since it was founded, because she used to receive its publications since its activities became systematic. 43. ↑ Committee memberswhose names are public recordcan ascertain that. The Same was confirmed to the author by credible sources. 67. ↑ David Meyer and Debra Minkoff, “Conceptualizing Political Opportunity”,Social Forces, Vol.82, No. 4, June 2004, pp.1457-1462, 1480-1485. 68. ↑ Regarding the inability to craft mechanisms of negotiation that follow clear rules, and the mistrust between civil and political actors after 2011, see: Aly El Raggal and Heba Raouf Ezzat, “Can a Revolution Be Negotiated”, in: Arab Spring: Negotiating in the Shadow of Intifada, London: The University of Georgia Press, 2015, pp.80-115. 70. ↑ It is important to understand everyday life as a field of contestation with the powers over historic right, per se, and not just contestation of the physical rights. See Agnes Heller’s important and relevant work: Agnes Heller, Everyday Life, London: Routledge and Kegan Paul, 1970. 71. ↑ One of the most important papers in this regard is Henri Lefebvre’s book on the critique of everyday life, and ‘occupying time’ and Richard Sennet’s work on using ‘informality’ in resistance. See: Henri Lefebvre, Critique of Everyday Life, translated by John Moore, London: Verso, 1991; Richard Sennet, The Uses of Disorder:Personal Identity and City Life, N.Y.: W.W. Norton, 1992. 72. ↑ Stephen Graham’s understanding of the militarization of cities is taking shape in Cairo and in other bigger cities, and of course it is happening in Sinai, while noting the particularity of its situation. And it is happening fast. See in Arabic:ستيفن جراهام، مدن تحت الحصار: فضائح العنف العسكري وعسكرة التنظيم المدني، ترجمة ميراي يونس، شركة المطبوعات للتوزيع والنشر، 2013، ص ص 43-90، 503-547. 73. ↑ Regarding the New Administrative Capital and the Military mentality, see: Ursula Lindsey, “The Anti-Cairo”, Places Journal, March 2017. 77. ↑ Hassan believes that defending MB members should be an ethical duety. However, there is no theoretical framing available to establish an Arab concept for such ethics. This is due to the lack of interest and ability to theorize on human rights within the Egyptian rights community. See: Bahey el-Din Hassan, “A Question of Human Rights Ethics: Defending the Islamists”, in: Amr Hamzawy and Anthony Chase (eds. ), op. cit., pp. 38-48. 84. ↑ In this regard, see what Foucault wrote on punishment, and Agamben’s on the uses of bodies: Michel Foucault, Discipline & Punish: The Birth of the Prison, translated by Alan Sheridan, New York: Random House, 1995; Giorgio Agamben, The Uses of Bodies, translated by Adam Kotsko, California: Stanford University Press, 2016.